This article is based on part of my thesis for my master’s degree in human rights law. I edited the article with up-to-date references for publication in the Cosmopolis Journal. It is reproduced in full here, with their permission. You can download the full article, as a document, here. Or read it below. The European Convention on Human Rights enshrines the right to freedom of religion or belief through Article 9. However the approach of the European Court of Human Rights in cases dealing with so-called ‘blasphemy laws’ has come to favour a ‘religious freedom’ approach that promotes the feelings of religious believers over the right to criticize and dissent from religious orthodoxy. This has led to a reliance on the defence of freedom of expression, as enshrined in Article 10 of the European Convention, and then further to a scenario of ‘competing’ rights rather than a balanced assessment of the issues in any particular case. The approach of the European Court of Human Rights, so far, has been to grant State parties an almost limitless margin of appreciation, thereby tacitly endorsing the stifling effect of these so-called ‘blasphemy laws’. This interpretive view by the European Court of Human Rights is unsatisfactory and needs to be reviewed to ensure that the full meaning and purpose of Article 9 is not eschewed in favour of a narrow ‘religious freedom’ interpretation. This approach also risks undermining the universal nature of human rights, as well as the founding mission of the Council of Europe. The approach of the United Nations Human Rights Committee and Human Rights Council, however, is much more progressive. Freedom of religion or belief is protected by the International Covenant on Civil and Political Rights (ICCPR) Article 18. The United Nations approach, most notably through General Comment 22 and Resolution 16/18, recognises that the right to freedom of religion or belief is much more wide-ranging than is currently acknowledged by European Court of Human Rights jurisprudence. By adopting a comparative law approach, this paper will conclude that if the European Court of Human Rights was to adopt a similar interpretation in its considerations, the result would be a much more progressive implementation, in particular for those with non-religious beliefs, such as humanists and atheists. In this paper I will attempt to examine what the effect would be upon the jurisprudence of the European Court of Human Rights in relation to, so-called, ‘blasphemy’ laws, if it was to adopt the more progressive approach of the United Nations. In researching this paper, I had hoped to draw upon the experiences of other regional and international human rights bodies, however it became clear during my research that there was insufficient case law or scholarly work to draw upon. Instead I will compare and contrast the approach of the European Court of Human Rights, and the United Nations. This paper will examine the treatment of national ‘blasphemy’ laws, and those accused and convicted of such offenses. The right to freedom of thought, conscience and religion is enshrined in the Universal Declaration of Human Rights. The European Convention on Human Rights (ECHR) also guarantees the right to freedom of thought conscience and religion under Article 9. Article 9 is often used in legal proceedings in conjunction with Article 10, which guarantees the right to freedom of expression. As we will see in the later analysis, much of the argument in this paper against the current European Court of Human Rights interpretation has to do with the court’s apparent desire desire to see issues of ‘blasphemy’ as a competing claim of Article 9 against Article 10. As a result of this, most cases, and even public opinion now, has come to refer to the debate as one of ‘religious freedom versus freedom of expression’. This is a regrettable development and one that this paper aims to challenge. Whereas freedom of thought, conscience and religion or belief is an unqualified right, freedom of expression is a qualified right under the United Nations International Covenant on Civil and Political Rights. The nature and level of this qualification varies from State to State but it can include the use of laws such as libel and defamation against individuals, hate speech and incitement to violence and discrimination against individuals or groups. Blasphemy laws are different from these other types of general qualification by requiring an absolute and arbitrary ban on the legitimate criticism of religious beliefs. Blasphemy laws therefore represent in practice an attempt to prohibit, problematize or exclude freedom of expression in relation to the legitimate activities of questioning, challenging and criticising religion, not to mention satire or ridicule. Discussion of issues related to religion and belief should be seen as legitimate and necessary in a democratic society. Therefore laws which seek to arbitrarily protect religion, religious individuals and the feelings of religious people, should be seen as contrary to the principle of free expression. After all, there is no right to be protected from offence. This formulation of competing rights is a direct consequence of some of the early jurisprudence from the European Convention on Human Rights. It does not – to the same extent – exist within the United Nations’ consideration of the issues at hand. In its consideration of the issue of blasphemy, the United Nations has taken a much broader and holistic view of the competing interests. Through some insightful analysis, the United Nations has arrived at a position much more in-step with a universal approach to human rights. This paper will use a comparative law approach to analyse the different treatments of blasphemy within the European and international systems. There have been some previous examples of scholarly examination of blasphemy laws through a comparative law perspective. Previous works, however, have focussed on a comparison between local State law and general international trends or norms, rather than a direct comparative analysis between different international human rights bodies directly. This paper will conclude that if the European Court of Human Rights was to adopt the same approach as the United Nations on the treatment of blasphemy, then it would have a much stronger set of jurisprudence, as well as a more coherent and thoughtful approach to understanding the delicate balance of rights at stake. In this essay I will adopt a comparative law approach. This approach will allow me to compare and contrast different elements of how the European Court of Human Rights and the United Nations approach the issues related to ‘blasphemy laws’, and to look for similarities and differences. The reason for using a comparative law approach is that I wish to advance an argument that the European Court of Human Rights should acknowledge and follow the direction developed by the United Nations bodies in relation to the treatment of ‘blasphemy’ laws. Of course we must acknowledge that the legal basis of both systems are very different, differing from monist and dualist systems across the territorial applicability of the ECHR, to the United Nations system of ‘soft law’ influence and international treaties. One of the purposes of comparative law is to assess and analyse the laws of different States, with a view towards harmonisation, or to draw upon strengths in one domain in order to benefit the another. Despite their local differences, especially related to how they are ratified and brought into domestic legislation at the State level, as a set of legal and ethical principles human rights aspire to be universal, so there should be much to learn from a comparative analysis of both systems. The European Court of Human Rights has been praised in the past for its relative openness to comparative law perspectives, however this has not been the case on the issue of blasphemy. The European Court of Human Rights and the United Nations are two very different institutions, with two very different purposes. However, there is still a lot that can be learned, not least through an awareness-raising and information sharing process. The two institutions differ greatly in structure and resources: the European Court of Human Rights is a vastly overstretched judicial body with a long backlog of cases, and whilst the United Nations’ system may not be as well-funded as they would like, the sheer size and scope of the various bodies and organs allows for a much fuller engagement with on the ground experience. It is within and between these two perspectives that there will be much to learn. “1: the act of insulting or showing contempt or lack of reverence for God b: the act of claiming the attributes of deity; 2: irreverence toward something considered sacred or inviolable”. Of course that situation has changed a lot in the preceding centuries and now prospective blasphemers can merely expect a small fine or short prison sentence, in the minority of European states where it is still proscribed. However as Gatti suggests, we should avoid being overly relaxed about the effects of blasphemy laws. This essay will explore the practical effects, and examine some recent examples of, blasphemy prosecutions, although it is worth noting at this stage that the very principle of a law against blasphemy will be unacceptable to many. “I think this has particular relevance at the current time, when many countries are demographically secularizing, and debates about the demands that can be mandated by “religious freedom” frequently make headline news. Indeed the United States is one of the countries where this contrast between F[reedom of religion and belief]-as-human-right and “religious freedom”-as-privilege is most stark. The constitutional protection of religious liberty in the US constitution is largely very clear and very close to the modern F[reedom of religion and belief]-as-human-right. And yet “religious freedom” is widely and mistakenly being used as an excuse to demand privileges, to deny services, or to discriminate – usually against women and sexual minorities, sometimes against children, against the non-religious, against religious minorities, or along racial lines”. This important speech also built upon previous international work on freedom of religion or belief. In 1993, the UN Human Rights Committee issued a general comment on the subject which said “Article 18 [of the International Covenant on Civil and Political Rights] protects theistic, non-theistic and atheistic beliefs, as well as the right not to profess any religion or belief”. There are more ‘blasphemy laws’ outside of Europe, and in many cases they carry much harsher punishments. 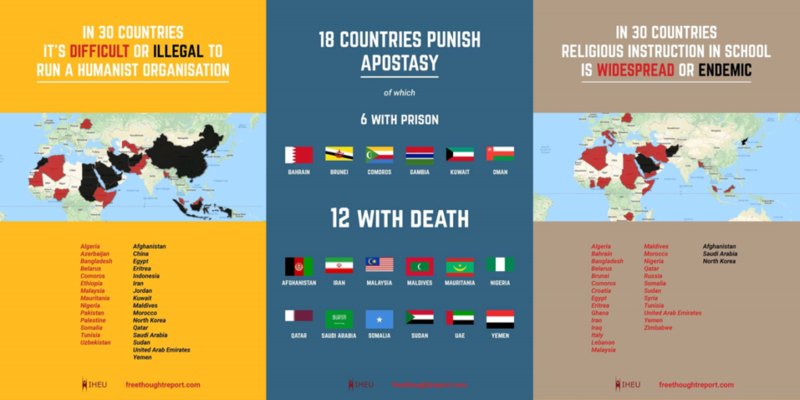 There are five States in which blasphemy is a capital offence, and a further eight in which the closely-related crime of ‘apostasy’ is a capital offence (and acts of ‘blasphemy’ may readily be taken as evidence of ‘apostasy’). These countries are mainly Muslim-majority countries: Afghanistan, Iran, Malaysia, Maldives, Mauritania, Nigeria, Pakistan, Qatar, Saudi Arabia, Somalia, Sudan, United Arab Emirates and Yemen. In 42 States, blasphemy is an imprisonable offence (i.e. excluding the 5 countries where the maximum sentence is death). In late September, 2012, a man was arrested in Greece, on charges of posting “malicious blasphemy and religious insult on the known social networking site, Facebook”. The accused, 27-year-old Phillipos Loizos, had created a Facebook page for “Elder Pastitsios the Pastafarian”, playing on a combination of Elder Paisios, the late Greek-Orthodox monk revered as a prophet by some, and the Greek food pastitsio. “Pastafarian” refers to the spoof religion of the Church of the Flying Spaghetti Monster, itself an intentional pun on aspects of Creationism. A manipulated image on the Facebook page depicted Elder Pastitsios with a pastitsio where the monk’s face would normally appear. On January 16, 2014, the creator of the original “Elder Pastitsios” website was found guilty of “repeatedly insulting religion” and was sentenced to ten months in jail, suspended., What might have been a trivial webpage, simply satirizing religious reverence and seen by few, became a major focal point in the blasphemy debate in modern Italy, and moreover the prosecution seriously derailed the life of Phillipos Loizos for several years. This case study serves to illustrate the non-trivial risks associated with blasphemy laws, even in a relatively progressive country such as Greece, . Loizos eventually had all of the charges of blasphemy against him dropped and was released from pre-trial detention. There have been relatively very few decisions of the European Court of Human Rights in relation to blasphemy, either directly or indirectly. Since the 1990s, the court, and its predecessor – the Commission, have examined only six cases. This small number allows us to explore, in some detail, each of the judgements and analyse the resultant jurisprudence. The European Court of Human Rights did not examine any cases involving Article 9 until 1993. The first case involving blasphemy dealt with the publication of The Satanic Verses by Salman Rushdie in 1988. The novel contained many references which some Muslims found offensive about figures in their religion. In response to this a Mr Choudhury sought permission from the Bow Street Magistrate Court to seek a criminal prosecution against Mr Rushdie for blasphemous libel. Permission was refused, and Mr Choudhury appealed. Interestingly, the permission was refused because the magistrate was of the view that whilst the English law of blasphemy proscribed the criticism of religion, it only applied to the religion of Christianity. His appeal was dismissed by the Divisional Court of the High Court on 9 April 1990, and appeal to the House of Lords was refused. Mr Choudhury then applied to the European Commission on Human Rights, who also dismissed his case. In their decision to dismiss the case, the European Commission on Human Rights observed the following: “He does not claim, and it is clearly not the case, that any State authority […] directly interfered in the applicant’s freedom to manifest his religion or belief”. This is also particularly unusual since, as Kearns notes, the European Convention is specifically a living instrument. “As in the case of “morals” it is not possible to discern throughout Europe a uniform conception of the significance of religion in society; even within a single country such conceptions may vary. For that reason it is not possible to arrive at a comprehensive definition of what constitutes a permissible interference with the exercise of the right to freedom of expression where such expression is directed against the religious feelings of others.” . This case has had profound implications for the European Court of Human Rights jurisprudence around Article 9. In this case the European Court of Human Rights has essentially read in a right for religious people to not be offended. One could understand an argument that Article 10.2 allows a state to limit free expression in the interests of avoiding public disorder, but by specifically establishing that the feelings of religious people are to be protected, the European Court of Human Rights has created a novel and self-contradictory principle. Gatti observes that one paradoxical outcome of this judgement would be a requirement for all European states to introduce blasphemy laws. Another reason for the European Court of Human Right’s willingness to grant a wide margin of appreciation could be the large population of Roman Catholics in the region. However, we should note of caution from Andrew Copson, who observed in his speech to the UK Foreign and Commonwealth Office that: “For obvious reasons, measures of the non-religious population are notoriously difficult to attain in the countries where the non-religious are most oppressively silenced by this combination of state persecution and social exclusion – they don’t legally exist”. This is a really stark picture, and serves to underline the importance of understanding the chilling effect that blasphemy and religious defamation laws can have on individuals and groups of people. This decision by the European Court of Human Rights grants a seemingly limitless margin of appreciation to states in the pursuit of protecting the feelings of religious individuals, even if religious individuals themselves don’t object to the blasphemous act. It is difficult to see how the European Court of Human Rights has managed to reason itself into such a contradictory and illogical position, other than to suppose that it has taken an overly sensitive approach on issues which are considered ‘too controversial’, such as public ethics and morality. “we do not believe that these undoubtedly insulting and regrettable statements can be taken in isolation as a basis for condemning an entire book and imposing criminal sanctions on its publisher. Moreover, nobody is ever obliged to buy or read a novel […]. But it is quite a different matter for the prosecuting authorities to institute criminal proceedings against a publisher of their own motion in the name of “God, the Religion, the Prophet and the Holy Book” […]; a democratic society is not a theocratic society”. It has been argued that a justification for the European Court of Human Rights granting of a wide margin of appreciation is a sensitivity to the role that religious belief plays in a state’s culture, and that in some particular cultures where the state is formally secular, adherence to religious belief is seen as a challenge to the state’s supremacy; that in some sense adherence to a religious organisation is tantamount to allegiance to a foreign state. This explanation does not satisfactorily explain the decisions of the European Court of Human Rights in Wingrove and Otto Preminger-Institut, where the European Court of Human Rights was dealing with states with a long tradition and influence of Christian religion. What we can say from an examination of the European Court of Human Rights jurisprudence on blasphemy is that it remains thankfully rare and it is also criticised, . It is clear that the European Court of Human Rights has relied on the doctrine of margin of appreciation in a fashion which Leigh calls ‘institutional modesty’ and ‘judicial diplomacy’. This approach by the European Court of Human Rights leads to a tendency to limit the necessary discussion and critique of religious ideas. Of course, this ignores the potential threat, or ‘chilling effect’, that dead letter blasphemy laws can have on freedom of expression. Even recently we have seen the threat that such laws can have through the public accusation of Stephen Fry under allegations of blasphemy. The Lisbon Treaty of the European Union even recognises the “…cultural, religious and humanist inheritance of Europe, from which have developed the universal values of the inviolable and inalienable rights…” . In 2001 the European Humanist Federation complained to the Ombudsman of the European Commission after they were denied permission to organise a dialogue session on the rights of non-religious people, despite the Commission holding regular sessions with religious groups. The Ombudsman upheld the complaint by the European Humanist Federation, finding that the European Commission had committed a ‘maladministration’. In the existing literature on blasphemy there exists one key unexamined argument, which if given serious consideration, should prompt a major review of the European Court of Human Right’s approach to such matters. Leigh glances this when he concludes that the European Court of Human Rights jurisprudence often imagines a clashing of competing rights of the Article 9 rights of religious people (and their feelings) and the Article 10 rights of the blasphemers. What Leigh fails to articulate is the legitimate argument that there exist many individuals across Europe who hold a a coherent, non-religious, broadly humanist worldview. Leading Humanist philosopher Peter Cave outlines that “[t]he humanist response [to blasphemy] is that the value of free speech outweighs any offence caused”, and goes on to say that challenging beliefs is “…essential to our humanity’s reasoning…”. These considerations should shift the terms of the debate significantly, especially given the widespread significant decline of religious identification across areas of Western Europe, and there is no doubt that the impact and importance of Humanism in Europe has been overlooked due to a pro-Christian bias, , . It follows from this that some of the activities we have seen criminalised as blasphemy, could be reformulated as an embodiment of the Article 9 rights of Humanists, rather than as an Article 10 defence against them – which as we have seen, the European Court of Human Rights has a very poor track record of dealing with. This reformulation of the argument could circumvent some of the major stumbling blocks that the European Court of Human Rights encounters when dealing with blasphemy cases. The first being the problem of squaring the interests of groups (religious people, and their feelings) with that of individuals (blasphemers). When we understand that blasphemers are not merely troublesome lone rangers, but members of a large and unappreciated body of fellow Humanists, we avoid the situation whereby blasphemy is treated as a trade-off of rights. Secondly, whereas the European Court of Human Rights has been content to censor expression on the basis of the hypothetical hurt feelings of religious individuals, the suggested approach would surely require it to take account of the hypothetical hurt feelings of Europe’s Humanists when it considers limiting the free and open criticism of religious ideas. This approach can be seen as a ‘levelling-up’ approach; in that is seeks to operationalise Article 9 as a defence for non-religious individuals on the same basis as religious ones. However, this ‘levelling-up’ approach has been criticised for some as being inelegant, on the basis that it seeks to mitigate a problematic inequality by further entrenching it. That is to say that it could be argued that it is wrong, at least on an ethical or moral basis, to argue against a perceived privilege and then seek to have the self same privilege applied to oneself. However, one might argue that the ‘privilege’ ceases to exist if essentially everyone can share in it. It is clear from an examination of the European Court of Human Rights jurisprudence on the issue of blasphemy that it has erred consistently in favour of granting states a wide margin of appreciation to censor expression which it considers to be blasphemous. In doing so the European Court of Human Rights has read in a right for religious people to be protected from hypothetical offence, at the expense of the legitimate aim of criticising religious ideas. In the few cases that the Court has dealt with pertaining to blasphemy, all have operationalised Article 9 as a guarantee of ‘religious freedom’, despite the Article covering a range of religious and nonreligious beliefs. The European Court of Human Rights has not yet had the opportunity to consider how the Article 9 rights would apply to defend the rights of Humanists, and other non-religious groups, who place a high value – by virtue of their worldview – on rational enquiry, freethought and other activities which could be construed as blasphemous. This essay argues that such a proposal offers a potential solution (albeit an inelegant one) to ‘level-up’ the rights of blasphemers against the privileged rights of religious individuals before the European Court of Human Rights. Such a proposal would avoid a problematic scenario of ‘competing’ rights, by eliminating the need for the articulation of an Article 10 defence against charges of blasphemy. International Covenant on Civil and Poltical Rights Article 18, like Article 9 of the ECHR, also guarantees freedom of thought, conscience and belief. The issue of blasphemy was a very well debated subject in various United Nations platform in the late 1990s and early 2000s. In particular the Organisation of Islamic Cooperation (OIC) proposed and sponsored several motions which aimed to ban any expression which could be seen as “defamation of religion”. Like the European Convention, the International Covenant on Civil and Political Rights also protects freedom of expression through its article 19. As early as 1999, pressure from the OIC led to Pakistan bringing forward a resolution to the UN Commission on Human Rights which was called ‘Defamation of Islam’. According to the Becket Fund this proposal was brought forward to encourage the UN Commission on Human Rights to take a strong stand against a perceived campaign to malign and defame the Islamic religion. Understandably other delegates were unsatisfied by the sole focus on the Islamic religion and sought to expand the provision of the draft resolution to include all religions. In 2011 the political climate was such that the OIC shifted tactics to focus on a resolution for which they could seek support from Western countries. The result was Resolution 16/19. The resolution is a well written and thorough assessment of freedom of religion or belief. Importantly it also called upon state parties to take proactive action to foster dialogue and discussion, moving away from a polarising focus on competing rights. Resolution 16/18 has been the focus point of the United Nations approach to dealing with issues of blasphemy, and remains so. There have been other, newer, developments which seek to build on this, as we will discuss below. Whilst the Resolution does not mention blasphemy directly, it clearly touches on the issue – albeit in a more positive way. The United Nations Special Rapporteur on Freedom of Religion or Belief is an independent expert appointed by the Human Rights Council who is tasked with investigating and reporting on future obstacles which may hamper the enjoyment of these rights, as guaranteed under Article 18 of the International Covenant on Civil and Political Rights. This is a hugely progressive approach: specifically acknowledging that humanists, atheists and other non-religious groups and individuals are not only a legitimate partner in this joint venture, but often a specific minority group which is targeted for human rights violations. The Beirut declaration, and the work of Faith for Rights, also draws on the previous work of the United Nations Office of the High Commissioner for Human Rights-led Rabat Plan of Action on the prohibition of advocacy of national, racial or religious hatred that constitutes incitement to discrimination, hostility or violence. In conclusion, the approach of the United Nations bodies and appointed offices to the question of the treatment of blasphemy laws is much more progressive than that of the European Court of Human Rights. One of the major achievements of the United Nations’ consideration of blasphemy is their willingness to acknowledge the existence of meaningful beliefs other than ‘religious’ ones. The United Nations literature is much more willing to use the term belief, and attribute it equal weight and importance as religious beliefs. This is further underlined by the most recent report of the Special Rapporteur. The United Nations approach, compared to the European approach, is also proactive and future-focused. The United Nations has been able to make these progressive approaches due to its focus on consensus building, rather than an oppositional argumentative evaluation of the issues. This methodology could be one of the potential reasons why the United Nations has adopted such a progressive approach regarding the issue of blasphemy laws compared with the approach adopted by the European Court of Human Rights. It is only fair to note however the strong scholarly opinion which exists in support of the view that the European Court of Human Rights is itself a model of progressive consensus building – compared to other national and supranational juridical bodies. As we have seen through an analysis of the European Court of Human Rights jurisprudence, there is a strong tendency to grant an over-wide margin of appreciation in cases involving blasphemy laws. This tendency has been seen by some scholars as a dereliction of duty to adjudicate on an important matter of human rights, and dismissed by others as a pragmatic political move. What seems clear however is that the bodies of the United Nations are much more willing to approach the issue of blasphemy or religious defamation with a degree of criticality. There are several reasons why this might be the case. The United Nations has a wider perspective on the impact and practice of blasphemy laws, such as in Bangladesh and Pakistan, where they can and do lead to death sentences. In Europe, however, while the threat of imprisonment, censorship or a fine is not trivial, it is obviously not on the same scale of seriousness. This may be a key reason why there is much more of willingness from the international community external to Europe to see the harmful and anti-human-rights element of blasphemy laws as they apply, in particular to atheists and the non-religious. It could be argued that the more dangerous and deadly risks associated with blasphemy charges, particularly in Asia and the Middle East, create more of an incentive for policy- and lawmakers to reflect on the problem. Accusations of blasphemy in many Asian and Middle Eastern states are matters of life and death. Another of the successful elements of the United Nations approach, particularly that of Resolution 16/18, is the focus towards developing an understanding of the causal factors which might give rise to breaches of the human rights of people based on their religion or belief. This is an innovative approach which both acknowledges and deals with the ‘competing rights’ issue identified in the European Court’s jurisprudence. It could also be that this proactive approach goes some way to ameliorating the concerns that seem to motivate some Strasbourg judges in wanting to grant a wide margin of appreciation when making decisions on cases involving blasphemy. The United Nations approach is much more progressive than the distant and restrained approach taken by the European Court of Human Rights. Of course this may be one area where we have to acknowledge a significant difference, which may make the task of applying comparative law slightly harder, or even impossible. Whereas the European Court of Human Rights is clearly established as a juridical body, to settle legal disputes, the United Nations is something different. Whilst the United Nations is also charged with overseeing and implementing human rights law it does so in a very different way. Whereas the European Court of Human Rights operates within a given jurisdiction by adjudicating on a set of local rights outlined in the European Convention on Human Rights, the United Nations operates internationally and uses alliance building, persuasion and soft-law powers to achieve its aims. With this in mind, it might be understandable to conclude that a comparison on this matter may not be competent. However, one could turn this argument on its head and ask whether the relative success of the United Nations consensus-based model, over the adversarial approach of the European Court of Human Rights, could ever prompt a serious wide-ranging and fundamental review of how the European Convention implementation is overseen. What if instead of pursuing the model of adversarial litigation we were to see a new model evolve, harnessing the strength of the multilateral ‘soft-law’ approach of the United Nations? In conclusion we must say that blasphemy laws are wrong and endorse the approach of the United Nations in this matter. Blasphemy laws are a fundamental violation of freedom of expression; they insulate and protect dangerous religious practices and beliefs, their institutions and leaders, from the necessary and legitimate criticism needed to generate debate and reform. As we have seen from the European Court of Human Rights jurisprudence, the decision to treat blasphemy laws as a ‘competing rights’ issue between the right to freedom of expression on the one hand, and religious freedom on the other, is very problematic. The jurisprudence is also weak and underdeveloped due to the European Court of Human Rights’ reliance on awarding member States a wide margin of appreciation in how they interpret their Convention responsibilities. Such an approach is an abandonment of one of the core principles of human rights – universality. So, coming to the core question at the heart of this paper, what can we say about the likely impact on the jurisprudence of the European Court of Human Rights if it was to adopt the approach of the United Nations? Well, firstly we can say that the Court would be much more likely to accept the principle argued above: that non-religious worldviews – such as humanism – should be treated with equal weight and respect as religious worldviews. This seems fairly obvious given the clear commitment to parity of esteem running through the heart of the United Nations literature. This formulation would also have the secondary effect of shifting the debate on from a competing rights narrative, to one whereby the weighty issues are discussed and debated, and hopefully in such a way that the European Court of Human Rights would become less comfortable in granting a wide margin of appreciation for States to continue to practice blasphemy laws. We can secondly say that the Court may even be so minded as to find blasphemy laws incompatible with Articles 9 and 10 of the European Convention on Human Rights. As we have seen above, any serious assessment of the role and function of blasphemy laws by the United Nations has resulted in a call to end them, or at least acknowledge that they are incompatible with universal human rights in a fundamental way. In summary this paper concludes that if the European Court of Human Rights did follow the example set by the United Nations in its treatment of blasphemy laws, there would likely be a significant strategic change in the way that the arguments and decision are formulated. It may even result in greater pressure being exerted on state parties to abolish their current blasphemy laws. By which I also mean to include laws such as ‘defamation of religion’, apostasy or laws which are de facto blasphemy laws (i.e. not using the term “blasphemy”, but functioning similarly), for example laws which ban “insult to religion”, or “offending religious feelings” or “sentiments”, or “ridiculing religious beliefs” or general “contempt of religion” and similar phrasing. Such as the African Commission on Human and People’s Rights, and the Inter-American Court of Human Rights. Although, sadly, there are a long list of prosecutions and controversial legal cases which would benefit greatly from academic scrutiny. Specifically the Human Rights Committee, Human Rights Council and work of the UN Special Rapporteur on freedom of religion or belief, as well as general look at other initiatives and plans for the future. formally the Convention for the Protection of Human Rights and Fundamental Freedoms. By which I also mean to include laws against ‘religious insult’, ‘defamation of religion’ or ‘hurting religious sentiment’. Which includes, but is not limited to, questioning, criticising, satirising, mocking and ridiculing. United Nations Human Rights Council, Report of the Special Rapporteur on freedom of religion or belief (Focus: Perspective and vision for the mandate by new Special Rapporteur), 17 January 2017, A/HRC/34/50. This is despite the best attempts of the European Court of Human Rights to create one, as we will explore below. Jennifer F. Cohen, ‘Islamic Law in Iran: Can It Protect the International Legal Right of freedom of religion or belief?’, 9 CHI. J. INT’L L. 247 (2008), Intisar A. Rabb, ‘“We the Jurists”: Islamic Constitutionalism in Iraq’, 10 U. PA. J. CONST. L. 527 (2008), and Ossama Siddique & Zahra Hayat, Unholy Speech and Holy Laws: Blasphemy Laws in Pakistan–Controversial Origins, Design Defects, and Free Speech Implications, 17 MINN. J. INT’L L. 303 (2008). Esin Orucu & David Nelken, ‘Comparative Law: A Handbook’ (Oxford, 2007) pp. 44-65. Carozza PG. Uses and misuses of comparative law in international human rights: some reflections on the jurisprudence of the European Court of Human Rights. Notre Dame L. Rev.. 1997;73:1217. Venice Commission, ‘Report on the relationship between freedom of expression and freedom of religion: The issue of regulation and prosecution of blasphemy, religious insults and incitement to religious hatred’ (2008) Study 406/2006, adopted by the Venice Commission at its 76th Plenary Session, 17-18 October 2008. Not eight, as the Venice Commission claims. In the sense that they remain on the statute books, or have not been authoritatively overruled by judicial or legal processes. End Blasphemy Laws campaign, ‘Is Europe the land of freedom of expression?’ accessed 20 July 2017. Callum G Brown, Thomas Green and Jane Mair, Religion in Scots Law: The Report of an Audit at the University of Glasgow: Sponsored by Humanist Society Scotland (Edinburgh, HSS, 2016). Mauro Gatti, ‘Blasphemy in European Law’  in M. Diez Bosch and J. Sanchez Torrents (eds) ‘On Blasphemy’  Blanquerna 49. Copson also acknowledged that ‘freedom of religion or belief is itself a shorthand for the fuller freedom of thought, conscience, religion or belief. Andrew Copson, ‘We must resist “debased” forms of freedom of religion or belief’ (International Humanist and Ethical Union, 19 October 2016) accessed 20 July 2017. UN HRC General Comment 22 [CCPR/C/21/Rev.1/Add.4] adopted at the 48th Session (30 July 1993) available at accessed 20 July 2017. Robert Evans, ‘Atheists face death in 13 countries, global discrimination: study’ Reuters.com (10 December 2013, Geneva) available online at https://www.reuters.com/article/us-religion-atheists-idUSBRE9B900G20131210 [last accessed 20 July 2017]. Gordon Fairclough, ‘Greeks Seek Strength in the Powers of a Revered Monk to Predict Events; Elder Paisios Expected Travails; A Skeptical Facebook Page Draws Ire’ Wall Street Journal (New York, N.Y., 03 Dec 2012). By which I mean, they are a democratic member state of the Council of Europe and European Union. Keturah A. Dunne, ‘Addressing religious intolerance in Europe: the limited application of Article 9 of the European Convention of Human Rights and Fundamental Freedoms’ (1999) 1 California Western International Law Journal 117. Paul Kearns, ‘The end of blasphemy law’ (2008) 26 Amicus Curiae. As it was called before the name changed to the European Court of Human Rights. Choudhury v UK, no. 17439/90, Commission decision of 5 March 1991, unreported. Otto-Preminger-Institut v. Austria, no. 13470/87, § 26, European Court of Human Rights 1994. Ian Leigh, ‘Damned if they do, Damned if they don’t: the European Court of Human Rights and the Protection of Religion from Attack’ (2011) 17 Res Publica 55. Wingrove v. the United Kingdom, no. 525/611, §19, European Court of Human Rights, 1996. Aernout Nieuwenhuis, ‘The concept of pluralism in the case law of the European Court of Human Rights’ (2007) 3 European Constitutional Law Review 3 367-384. I.A. v Turkey, no. 42571/98, European Court of Human Rights, 2005. Kati Niemen, ‘Disobedient subjects – constructing the subject, the state and religion in the European Court of Human Rights’ (2015) 21 Journal for the Study of Race, Nation and Culture 4. Giniewski v France, no. 64016/00, § 1, European Court of Human Rights 2006. Klein v Slovakia, no. 72208/01, § 4, European Court of Human Rights 2007. Eric Barendt, ‘Religious Hatred Laws: Protecting Groups or Belief?’ (2011) 17 Res Publica 41. Pádraig Collins, ‘Stephen Fry investigated by Irish police for alleged blasphemy’ The Guardian (London, 7 May 2017). Richard Norman, On Humanism, Routledge: London, 2012. Kurtz, Paul. What is secular humanism?. New York: Prometheus Books, 2007.
International Humanist and Ethical Union, ‘Minimum Statement on Humanism’, available online http://iheu.org/humanism/what-is-humanism/ last accessed 20 July 2017. Consolidated Version of the Treaty on European Union preamble, 2010 O.J. C 83/01. The European Humanist Federation “…unites more than 60 humanist and secularist organisations from about 20 European countries. It is the largest umbrella organisation of humanist associations in Europe…” accessed 20 July 2017. Pasquale Annicchino, ‘Religion and EU institutions’ (2013) 15 Ecc. L.J. 3. Peter Cave, Humanism, Oneworld: Oxford, 2009. Ronan McCrea, Religion and the Public Order of the European Union, Oxford University Press: Oxford, 2010. Randall Lesaffer, European Legal History: A Cultural and Political Perspective, Cambridge University Press: Cambridge, 2009. Ronan McCrea, Religion and the Public Order of the European Union, OUP: Oxford, 2010. Dobras RJ, ‘Is the United Nations Endorsing Human Rights Violations: An Analysis of the United Nations’ Combating Defamation of Religions Resolutions and Pakistan’s Blasphemy Laws.’ (2009) 37(2) Ga J Int’l & Comp L 339. It is worth noting that Pakistan is one of the major violators of freedom or religion and belief rights. The 2016 annual Freedom of Thought Report from the International Humanist and Ethical Union notes “The legal environment in Pakistan is notably repressive; it has brutal blasphemy laws, systemic and legislative religious discrimination and often allows vigilante violence on religious grounds to occur with impunity.” As cited in International Humanist and Ethical Union, ‘Freedom of Thought Report’ (London, 10 December 2016) acessed online http://freethoughtreport.com/countries/asia-southern-asia/pakistan/ (last accessed 20 July 2017). The predecessor to the United Nations Human Rights Council,in March 2006 it changed to become the Human Rights Committee. The Becket Fund, ‘Defamation of Religions’ (July 2008). It is worth noting that this proposal was brought forward under the agenda item of ‘racism’. Temperman, Jeroen. “Blasphemy, defamation of religions and human rights law.” Netherlands Quarterly of Human Rights 26, no. 4 (2008): 517-545. It was during the time of the Arab Spring, where much emphasis was being placed on freedom of expression. The Office of the High Commissioner for Human Rights, ‘The Beirut Declaration and its 18 commitments on Faith for Rights’, (Beirut, March 2017). religious offences or overzealous application of various laws that use a neutral language. It is worth mentioning a very useful piece of guidance given in the UK employment tribunal of Grainger plc v. Nicholson which deals with the tricky idea of what constitutes a ‘belief’ (or at least one which would fall under the scope of Article 18. In the decision the judge says: “(i) The belief must be genuinely held. (ii) It must be a belief and not… an opinion or viewpoint based on the present state of information available. (iii) It must be a belief as to a weighty and substantial aspect of human life and importance. (iv) It must be worthy of respect in a democratic society, be not incompatible with human dignity and not conflict with the fundamental rights of others…”. Staff Writer, ‘You’ll be next: Bangladeshi blogger gets death threat on Facebook’ Times of India (Kolkata, 30 May 2015). In this case, international human rights law. At least in the narrow realm of blasphemy laws, defamation of religion and so on. Andrew Copson, ‘We must resist “debased” forms of freedom of religion or belief’ (International Humanist and Ethical Union, 19 October 2016) <http://iheu.org/we-must-resist-debased-forms-of-freedom-of-religion-or-belief/&gt; accessed 20 July 2017. Callum G Brown, The Death of Christian Britain: Understanding Secularisation 1800-1963 Routledge: London, 2000. Dzehtsiarou K and O’Mahony C, ‘Evolutive Interpretation of Rights Provisions: A Comparison of the European Court of Human Rights and the U.S. Supreme Court.’ (2013) 44(2) Colum Hum Rts L Rev 309. End Blasphemy Laws campaign, ‘Is Europe the land of freedom of expression?’ < http://end-blasphemy-laws.org/countries/europe/&gt; accessed 20 July 2017. Esin Orucu & David Nelken, ‘Comparitive Law: A Handbook’ (Oxford, 2007) pp. 44-65.
International Humanist and Ethical Union, ‘Freedom of Thought Report’ (London, 10 December 2016) acessed online http://freethoughtreport.com/countries/asia-southern-asia/pakistan/ (last accessed 20 July 2017). Paul Kurtz. What is secular humanism?. New York: Prometheus Books, 2007. UN HRC General Comment 22 [CCPR/C/21/Rev.1/Add.4] adopted at the 48th Session (30 July 1993) available at <http://hrlibrary.umn.edu/gencomm/hrcom22.htm/&gt; accessed 20 July 2017. UN General Assembly. (1948). Universal declaration of human rights (217 [III] A). Paris. Yvonne Donders, ‘The United Nations and Freedom of Expression’ (2015, Cambridge). Άρθρα - Articles, ΕΔΔΑ - ECtHR, Ελευθερία του τύπου - Press freedom, Θρησκευτική ελευθερία - Religious freedom, Υπερασπιστές ανθρώπινων δικαιωμάτων - Human rights defendersΕΝΩ.ΟΥΜ.Ε./H.U.G. - E.H.F. - I.H.E.U. Ελευθερία του τύπου - Press freedomΕΝΩ.ΟΥΜ.Ε./H.U.G. - E.H.F. - I.H.E.U. The European Humanist Federation and the International Humanist and Ethical Union (IHEU) presented the Freedom of Thought Report 2018, this year’s edition of the yearly status report prepared by the IHEU. The report documents the discriminations faced by people around the world because of their non-religious beliefs. It covers every independent country in the world and looks at issues like how freedom of religion or belief and freedom of expression and association are respected in law and in practice. The event was hosted by MEPs Sophie In’t Veld and Virginie Rozière who welcomed a panel of speakers stemming from very different horizons. Together, they shed light on the many discriminations that non-believers, free thinkers and humanists face across the world today. Among the speakers, Bob Churchill, Communications Director at the IHEU and main editor of the report provided an overview of the many persecutions, discriminations death and jail sentences endured by many non-believers in a number of countries. He emphasized the 19 countries in the world that brutally repress the expression of humanist values. He called the attention of the audience on the fact that 6 countries in the world punish apostasy with prison sentences and 12 others 12 with death. 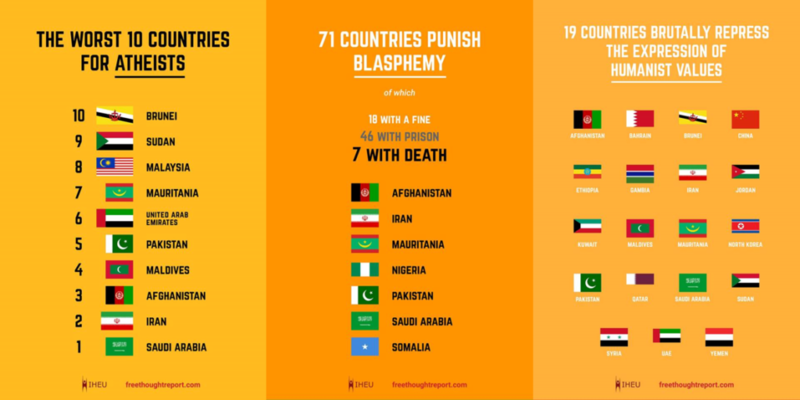 He added that 71 countries punish blasphemy, out of which 7 with a death sentence. Moreover, in 34 countries in the world, law is partly or entirely derived from religion and in 30 countries in the world, it is difficult or illegal to run a humanist organization. Jan Figel, Special Envoy for the promotion of freedom of religion or belief (FoRB) outside the EU, reminded the audience that Freedom of Religion or Belief includes the freedom not to believe or to change one’s religion. He also explained his view that the level of respect for Freedom of Religion or Belief in a country is a test for the level of democracy in general, as FoRB encompasses many fundamentals such as freedom of expression or freedom of assembly. He also emphasized that in his view instead of a confrontative approach with countries violating FoRB, a more encouraging approach should be adopted with those where change is happening. The highlight of the event however was the testimonies provided by two atheist activists who fled their countries because of death threats from Islamists. His contributions were complemented by Nacer Amari, a Tunisian human rights activist, Co-Founder of United Atheists of Europe and Prometheus Europe. Mr. Amari explained that despite a reputation of being quite secularized Tunisia still has a blasphemy law, there still is a state religion declared in Article 1 of the Constitution and public office can be held only by Muslims. Many other examples exist. The panel was concluded by Giulio Ercolessi, President of the European Humanist Federation who called for breaking the populist and extremist views that see all those coming to our countries as necessarily opposite and different from us. On the contrary, he emphasized that many who come to Europe appreciate our European open societies, our civic values and our rule of law more than populist politicians. Δίκαιη δίκη - Fair trial, Ευρωπαϊκό Κοινοβούλιο - European Parliament, Ελευθερία του τύπου - Press freedom, Θρησκευτική ελευθερία - Religious freedom, Σεξουαλικός προσανατολισμός και ταυτότητα φύλου - Sexual orientation and gender identity, Υπερασπιστές ανθρώπινων δικαιωμάτων - Human rights defendersΕΝΩ.ΟΥΜ.Ε./H.U.G. - E.H.F. - I.H.E.U.